One of the easiest ways to slow the aging process, and to avoid the risk of skin cancer, is to protect yourself from the sun. However, that “right off the beach” color is so tempting. So to avoid the damaging UVA/ UVB rays from the sun or from a tanning bed, we have the safe solution. 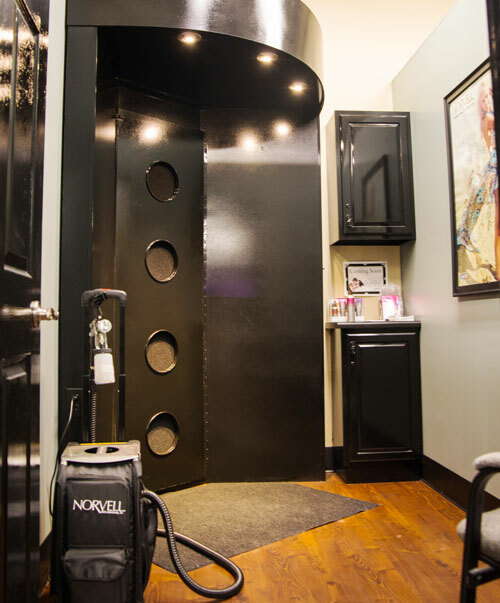 Norvell sunless solutions nourish the skin while also providing beautiful tanning results. This is an airbrush technique and not a booth spray. Our beauticians will physically spray you. Each tan should last approximately 4-7 days, however the longevity of the spray tan does vary with each individual. Not everyone’s daily activities are the same and excessive exercise or sweating will decrease the life of the tan. Swimming in chlorinated or salt water will fade results. Shaving is a form of exfoliation so it will affect the life of the tan. A professional applied tan will last longer than one applied at home. It is very important to exfoliate prior to your session and to moisturize daily after your session. Before you come in for your sunless tanning session we strongly recommend that you shower, shave and exfoliate your skin. Exfoliated skin helps create a more even, natural color. Do not wear any lotion, perfume, deodorant or makeup to your appointment. Keep in mind that once you have been sprayed you do not want to get wet for 8 hours, otherwise the solution will not take to your skin.